I was thinking about going down to Valdez on the bike and camping out but the weather guessers were predicting rain over most of the state for the long weekend. I know that I shouldn't be bothered by a bit of rain but for some reason it didn't sound like too much fun. The rest of my family was heading down to Oregon for a family reunion (my mom's side). I went online to see if I could get a mileage ticket down and was pleasantly surprised that I could. So for only 32,500 miles and $10 I had an aisle exit row seat down to Seattle and after a long layover, was on my way to Portland. 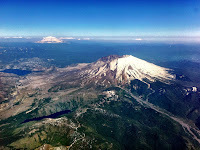 The weather has been great and the flight took us right next to Mt. St. Helens. I was surprised that there wasn't more snow. Today was spent hanging around a semi-deserted mall about ten miles south of the airport. My sister and brother in-law are picking us up from the mall and taking us to the reunion site about ten miles down the Columbia River gorge. The family has been having their reunions here for years since it is a wonderful, tranquil location. This is the view from the swimming pool at the reunion site. Vista House at Crown Point is on the far right of this AutoStitch pano shot. I'm not sure of the numbers yet but it looks like a pretty good turnout for the reunion. All pictures are from the Camera+ iPhone app. Sunday evening - This is the view to the west towards Portland. Tomorrow evening, we should be able to see some fireworks being fired off over the river. Today was very busy with lots of activities. Even though we have these reunions every couple of years, it is a real pleasure to see all the relatives again. That's a great shot of Mt St. Helens Richard! Oregon is always worth a trip. Enjoy the family reunion! Have fun at the reunion. We are having great 80˚ weather here in Oregon. What an awesome photograph! Looks like some breathtaking vistas. I could sit and gaze at that view for hours. Really cool that you were able to pick up a ticket cheap with your miles. Enjoy your time with the family. glad you managed another quick trip south to Oregon. It's refreshing to get away from routine and normal once in a while. Your reunion seems earlier this year than last when it was around mid month. Great photos. I especially like the last one. Thank you all for stopping by and commenting. As always, the reunion was a blast and it was a great opportunity to renew family relationships. The reunion was a couple of weeks early this time and the weather was definitely cooler. 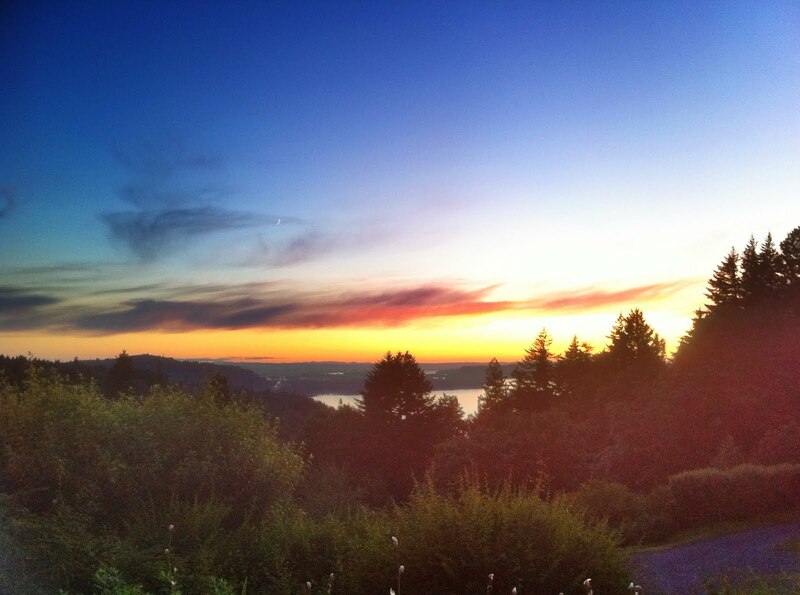 The Pro HDR and the Camera+ apps are by my favorites for taking pictures on the iPhone. Great pictures and a great price for a flight. My former wives held a reunion at a local baseball stadium, then went to a rifle range to relax. You sneak in and out like a burglar! Oh well, you know where to find me if you ever find yourself in need down here. Yep, sneaking in and out of Oregon. We didn't have a vehicle this time and pretty much stayed in the area between PDX and Crown Point.